Good luck to WEST Masters / Ljube Graovac, Cameron Hucker, Stephen Koss an Sarah Woodworth at Pan American Swimming Ghampionships in Orlando, Florida ! Good luck to Brendan Brooks at Special Olympics Canada Games in Nova Scotia ! Congratulations from all WEST Masters to Jennifer Agnew - BRONZE medalist in 3 km race on May 27 at Cancun, Mexico stage of the Global Championships 2017 ! Good Luck at FINA Masters World Championships in Budapest ! 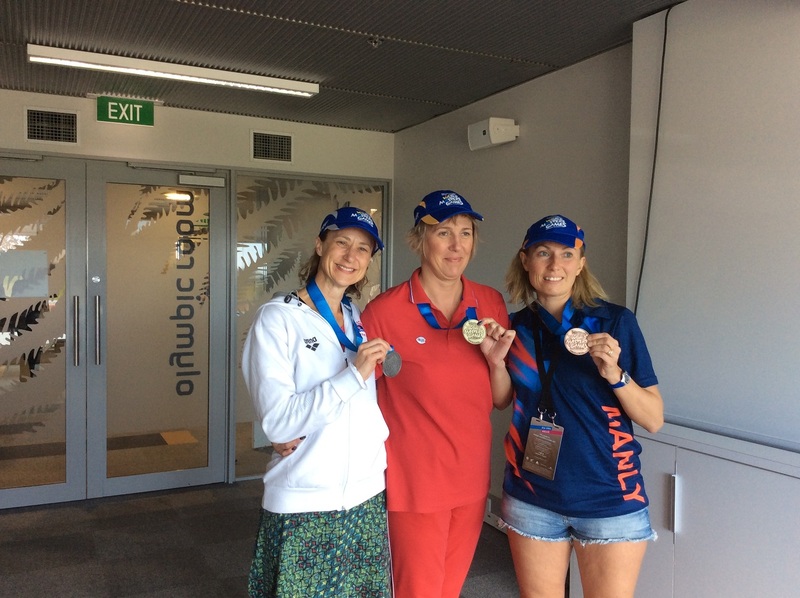 Congratulations to WEST swimmers Judy Autterson, Ljube Graovac, Lucie Lombardo, Andrei Semenov and Julia Smith with great results at World Masters Games// the biggest participatory multi-sport event in the World, April 21 - 30, 2017, Auckland, New Zealand. More than 28,000 athletes from 106 countries competed in 28 sports// at Olympic Games 2016 in Rio there were 11,000 athletes. WEST swimmers won total of 4 medals: Julia - 2 SILVER in 100 and 200 breast, Andrei - SILVER in 50 fly, Ljube - BRONZE in 50 breast ! Next competitions for WEST Masters will be World Masters Games in Auckland, New Zealand, April 21- 30, 2017 with 28000 athletes from more than 100 countries ( Click here ). Canadian Nationals 2015 in Montreal ! for very successful competitions ! * 10 out of 11 WEST swimmers won Medals ! * Lianne Archambeault, Michelle Gajewski, Matt Konior, Martha Shinkowski and Andrei Semenov are Champions in Individual events! * Total: 25 Individual Medals / 10 Gold and 8 Medals in Relays / 3 Gold ! * WEST finish in top 10 in overall Team Standings ! WEST finished in 8th place overall ! All WEST swimmers finished in top 5 !!!!!! 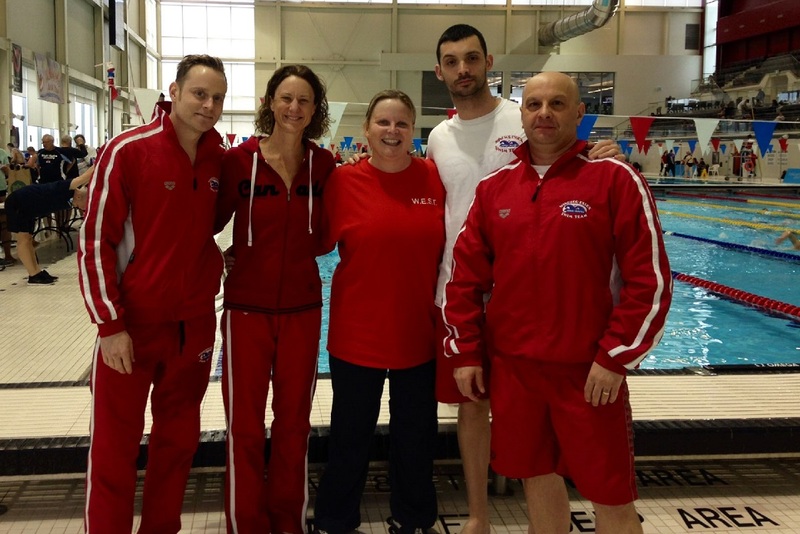 This past weekend WEST finished hosting its first-ever provincial level meet, the 2014 Ontario Masters Provincial Championships. This meet attracted nearly 500 competitors, and saw four World Records and multiple national and provincial records set over the five sessions in the pool at WIATC.This great swimming was made possible through the work of more than one hundred volunteers, many of them WEST parents and swimmers, who provided their time in making the meet run smoothly. Special thanks need to go to Dina Ozols who acted as meet manager, Jen Potma, Clint Cadden and Andrew Dalla Bona who put together the social evening, Nancy Hanes and Erika Dalla Bona who coordinated food services as well as secured financial support from local businesses for the meet, Jason Potma who handled technical logistics and Dave Denyer who helped coordinate the senior officials at the meet. For those who volunteered at a meet for the first time, we hope you enjoyed your time on deck and please know that you played an important role in making our first big meet successful. See you at the Amanda Reason Invitational in May. 2nd - 50 fly, 100 free, 100 breast, 200 free, 4x50 IM relay Karolina 1st- 100 breast, and 4x50 free relay with Michelle, 2nd -4x50 IM relay, 3rd- 50 fly, 50 back. Klaudia was to young and had to swim with older girls, her best was 6 place in 50 back. Maciej Konior: 1st in 50 fly, 50 free, 100 free, 200 free, 100 IM, 100 breast, 5th tin 4x50 free and 4x50 IM relays. Maciej's daughters competed in Age Group devision. Karolina 1st- 100 breast, and 4x50 free relay with Michelle, 2nd -4x50 IM relay, 3rd- 50 fly, 50 back. Klaudia was to young and had to swim with older girls, her best was 6 place in 50 back. for successful completion of the "Ribbon Cutting Time Trial"
The 14th Fina World Masters Championships says goodbye. Next stop is Montreal (Canada) 2014. Around 13000 athletes joined Riccione in the last two weeks for the most numerous championship ever. Men. 200 Medley Relay. Graovac, Christmas, Semenov, Skutovich 50th. Around 10000 swimmers, 2400 open water (many of them swam in the pool too), 1400 waterpolo players, 580 synchronised swimmers, 270 divers. Jamie Skutovich - 7th in 200 free, 8th in 100 breast, 11th in 100 free. Windsor Essex Swim Team results from Eastern Michigan University Coldest Masters swim meet. January 15, 2012. Ypsilanti, Michigan. Skutovich Jamie - 2nd in 100 breast, 3rd in 50 breast, 50 and 100 free. 400 Medley. 1st. Ljube Graovac, Clint Cadden, Ovidiu Ognean, Jamie Skutovich. 400 Free. 2nd. Ovidiu Ognean, Craig Pearce, Andrei Semenov, James Doherty. Clint Cadden, Ljube Graovac, Ovidiu Ognean, Craig Pearce, Andrei Semenov, Jamie Skutovich and Stephanie Zarins are qualified for 14th Masters World Championships, June 8-15, 2012, Riccini, Italy. 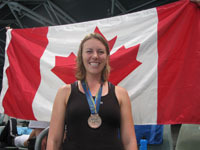 In 2009 in Sydney two swimmers from WEST won medals. Matt Buttler-gold in 100 back, silver in 50 back and bronze in 200 back. Stephanie Zarins - bronze in 200 and 400 free. Matt Butler - World Champion in 100 back ! Silver in 50 back and Bronze in 200 back. Stephanie Zarins - Bronze medals in 200 and 400 free ! 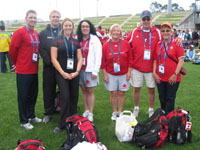 at World Masters Games in Sydney, Australia. Way to go WEST ! I had a pleasure to coach Cliff and Kim as my swimmers and work with Ilia as co-coach in Etobicoke.